mairuru: My new american fabrics and new skirt!! Today I got these fabrics from the U.S., Sew Mama Sew. I wrote an article for their blog, and they gave me the coupon for their shop (* v *)!!!! So I could get them. I'm really happy girl (woman??). I go to my parents house tomorrow morning. And I made this skirt with one of these fabric tonight. It took 3 hours, because I made them all by my hands, as always. I used a free pattern from Japanese pattern shop. It's only in Japanese, I'm sorry. 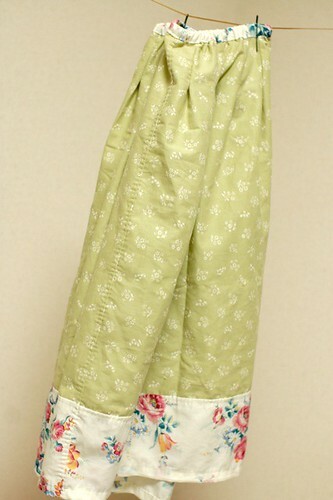 It uses elastic for waist but it has many tucks so it appears neat than usual elastic skirt. 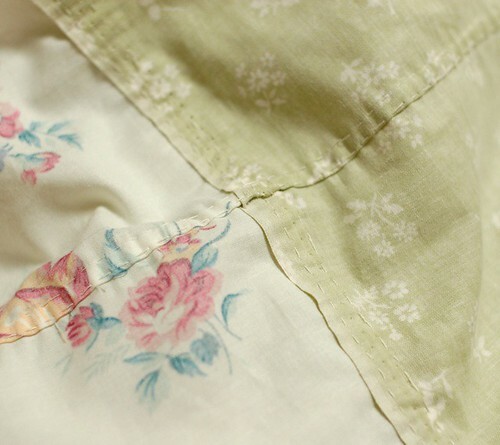 I sew it with french seam stitch. The green fabric is Japanese cotton. This skirt costs only 5 dollars (* v *)!!!! Oh, I decided to bring my favorite book of John Irving, "A PRAYER FOR OWEN MEANY", in English. I hope I could read it during my travel. great stash of fabric! lucky girl ;-). and the skirt is pretty too... enjoy your visit to your parents house. have a great weekend! Absolutely beautiful! I hope your trip goes well. s one very beautiful skirt. have a good trip - I am visiting my daughter soon - it is also a long journey - part of the fun is planning what to read and take for the train! The better part is when you get to hug your family! Wow .... love the material and your new skirt. Will send you a photo ok? Enjoy the precious family time. Such a lovely skirt! 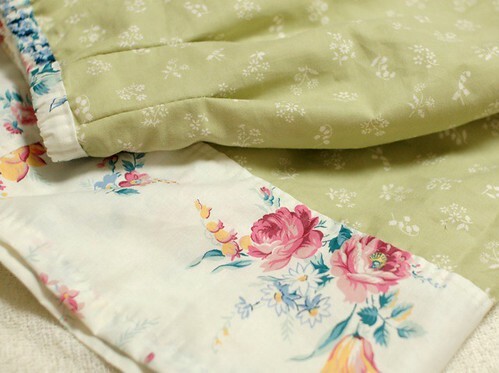 The rose material is so pretty and the little white flowers on the green Japanese cotton are so delicate. I have been wanting to read that book, too. Be sure to post about it after you read it. I enjoy your blog. Your work is beautiful and I love reading your comments. You seem like such a nice person. A Prayer for Owen Meany is one of my favorite books too. I think I'll read it again. 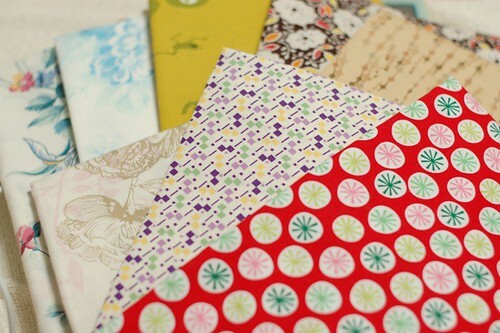 what a nice pile of fabric to make into the sweet goodies that your hands create! Beautiful skirt!! You are so very , very blessed with talent. Hope our trip is wonderful! A Prayer for Owen Meany is one of my favorite books! I love the way it makes you think deeply on things. It's just... so good. WOW! This skirt looks awesome! So cute and simple to make! Mai, that is a gorgeous skirt! I love it lots. 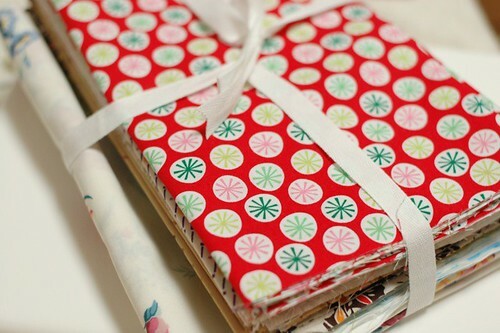 :) And those fabrics are really pretty! I hope you had a good weekend and have a merry week ahead! Love to you! You mean that you don't use a machine to sew? Because, if so, your stitches are perfect! Wow. Nice fabrics! I am always amazed at all you do completely by hand! OH My.. Aside from Wuthering Heights, A Prayer For Owen Meany is my absolute favorite book!!!! I still see images of Owen in Sunday school being passed over the heads of his classmates and I hear that small wrecked voice! Excellent Read!!! Wow! I'm impressed! I love the fabrics you picked for your skirt. This is beautiful, and inspiring. Your hand sewing is gorgeous. You sew much faster than I do, using a machine. And much, much nicer. I am so impressed. I am so glad that I read about you on Sew Mama Sew. This is beautiful--all your work amazes me! I looked at the skirt pattern...and found a site that translates the information a little--enough I think to understand! Can I ask what type of shirt you think you will wear with this skirt?